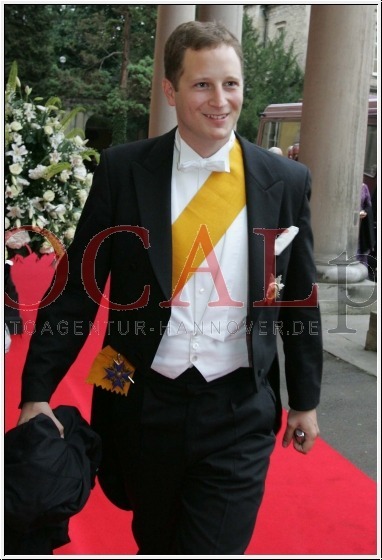 Georg Friedrich Ferdinand, Prince of Prussia (German: Georg Friedrich Ferdinand Prinz von Preußen; born 10 June 1976) is the current head of the Prussian branch of the House of Hohenzollern, the former ruling dynasty of the German Empire and of the Kingdom of Prussia. He is the great-great-grandson and historic heir of Wilhelm II, the last German Emperor and King of Prussia, who was deposed and went into exile upon Germany's defeat in World War I in 1918. Georg Friedrich is the only son of Prince Louis Ferdinand of Prussia (1944–1977) and Countess Donata of Castell-Rüdenhausen (1950–2015). Born into a mediatised princely family, his mother later became Duchess Donata of Oldenburg when she married secondly Duke Friedrich August of Oldenburg, who had previously been married to her sister-in-law Princess Marie Cécile of Prussia. His only sister is Princess Cornelie-Cécile of Prussia (b. 1978). After the death of his father, Georg Friedrich spent much of his youth in the care and under the guidance of Louis Ferdinand, his paternal grandfather. He attended grammar schools in Bremen and Oldenburg and completed his education at Glenalmond College near Perth, Scotland, where he passed his A-levels. He then volunteered for a two-year commission in the Alpine troops of the Bundeswehr, where he was known simply as Preußen ("Prussia"). In May 2011 he was promoted a Major of the reserve. Georg Friedrich took his degree in business economics at the Freiberg University of Mining and Technology. Georg Friedrich works for a company specialising in helping universities to bring their innovations to market. He also administered the Princess Kira of Prussia Foundation, founded by his grandmother Grand Duchess Kira of Russia in 1952, now administered by his wife. In 2018 he moved from a house near Bremen, where he had also spent his childhood, to Babelsberg, a district of Potsdam, the capital city of the German state of Brandenburg. He owns a two-thirds share of his family's original seat, Hohenzollern Castle, while the other share is held by the head of the Swabian branch, Karl Friedrich, Prince of Hohenzollern. He also owns the Princes' Island in the Great Lake of Plön. In 2017 he founded a beer trademark called Kgl. Preußische Biermanufactur (Royal Prussian Beer Manufactory) producing a Pilsner brand called Preussens. Prince Georg Friedrich continues to claim compensation for land and palaces in Berlin expropriated from his family, a claim begun in March 1991 by his grandfather Prince Louis Ferdinand of Prussia under the Compensation Act (EALG). Georg Friedrich succeeded his grandfather, Louis Ferdinand, as Head of the Royal House of Prussia, a branch of the House of Hohenzollern, on 26 September 1994. He learned to appreciate the history and responsibility of his heritage during time spent with his paternal grandfather, who often recounted to him anecdotes from the life in exile of his own grandfather, the last German Kaiser, Wilhelm II. His position as sole heir to the estate of his grandfather was challenged by his uncles, Friedrich Wilhelm and Michael, who filed a lawsuit claiming that, despite their renunciations as dynasts at the time of their marriages, the loss of their inheritance rights based on their selection of spouse was discriminatory and unconstitutional. His uncles were initially successful, the Regional Court of Hechingen and the higher Regional Court of Stuttgart ruling in their favour in 1997 on the grounds that the requirement to marry equally was "immoral". However, the Federal Court of Justice of Germany overturned the original rulings in favour of Georg Friedrich's uncles, the case being remanded to the courts at Hechingen and Stuttgart. This time both courts ruled in favour of Georg Friedrich. His uncles then took their case to the Federal Constitutional Court of Germany which overruled the previous court rulings in Georg Friedrich's favour. On 19 October 2005, a German regional court ruled that Georg Friedrich was indeed the principal heir of his grandfather, Louis Ferdinand (who was the primary beneficiary of the trust set up for the estate of Wilhelm II), but also concluded that each of the children of Louis Ferdinand was entitled to a portion of the Prussian inheritance. 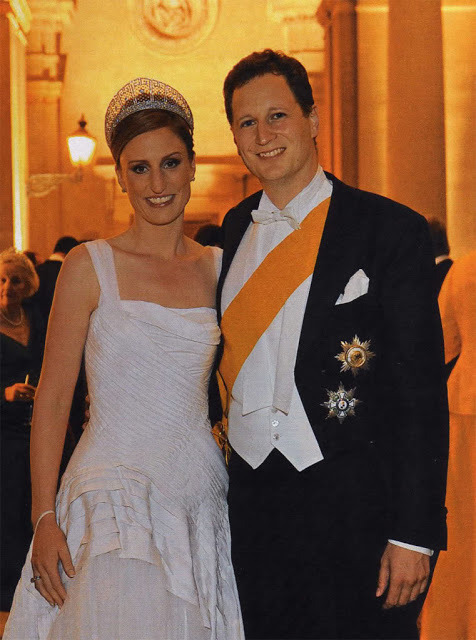 On 21 January 2011, Georg Friedrich announced his engagement to Princess Sophie Johanna Maria of Isenburg (born 7 March 1978), who studied business administration in Freiburg and Berlin and works at a firm that offers consulting services for nonprofit business. The civil wedding took place in Potsdam on 25 August 2011, and the religious wedding took place at the Church of Peace in Potsdam on 27 August 2011, in commemoration of the 950th anniversary of the founding of the House of Hohenzollern. The religious wedding was also broadcast live by local public television. The dinner, which many members of German and European royal families attended, was held in the Orangery Palace at Sanssouci Park. As a Protestant descendant of Queen Victoria, Georg Friedrich was in the line of succession to the British throne from his birth until his marriage in 2011. As he married a Roman Catholic, according to the Act of Settlement 1701, he was thus debarred from the British line of succession until the implementation in 2015 of the Succession to the Crown Act 2013, which restored any succession rights to British dynasts forfeited because of marriage to Roman Catholics. Georg Friedrich is currently 170th in line to the British throne. On 20 January 2013, Georg Friedrich's wife, Sophie, gave birth to twin sons in Bremen, Prince Carl Friedrich and Prince Louis Ferdinand. Carl Friedrich, the elder of the two, is the heir apparent. The boys were baptized in the Chapel of St. Michael at Hohenzollern Castle on 24 June 2013. Their third child, Princess Emma Marie, was born on 2 April 2015. She was baptized in the Chapel of St. Michael at Hohenzollern Castle on 13 June 2015. Her godparents are Archduchess Katharina of Austria (mother's sister) and Prince Otto of Castell-Rüdenhausen (father's first cousin). On 17 November 2016, Sophie gave birth to Prince Heinrich. Prince Heinrich was baptized in the Chapel of St. Michael at Hohenzollern Castle on 13 May 2017. ^ In 1919 royalty and nobility were mandated to lose their privileges in Germany, hereditary titles were to be legally borne thereafter only as part of the surname, according to Article 109 of the Weimar Constitution. Styles such as majesty and highness were not retained. ^ Regarding personal names: Prinz was a title before 1919, but now is regarded as part of the surname. It is translated as Prince. Before the August 1919 abolition of nobility as a legal class, titles preceded the full name when given (Graf Helmuth James von Moltke). Since 1919, these titles, along with any nobiliary prefix (von, zu, etc. ), can be used, but are regarded as a dependent part of the surname, and thus come after any given names (Helmuth James Graf von Moltke). Titles and all dependent parts of surnames are ignored in alphabetical sorting. The feminine form is Prinzessin. ^ "Germany 1815-90; Vol II 1852-71". Books.google.com. Retrieved 2017-12-15. ^ a b c "Heir to Prussian throne to get televised wedding". Expatica.com. 2011-08-25. Retrieved 2017-12-15. ^ "George Frederick The Prince of Prussia". Retrieved 27 August 2011. ^ "Preußen-Prinz bittet Berlin zur Kasse". Südwest Presse Online. Retrieved 2017-12-15. ^ Majesty. Interview, March 2009. ^ a b Francois Velde. "The Hohenzollern Succession Dispute". Heraldica.org. Retrieved 2017-12-15. ^ For further details, see the German-language Wikipedia article Ebenbürtigkeit. ^ "Prinz Georg Friedrich von Preußen Er hat sich mit Sophie verlobt!". 22 January 2011. Retrieved 27 August 2011. ^ "Verlobung im Haus Hohenzollern". Preussen.de. Retrieved 2017-12-15. ^ "Prinz von Preußen heiratet in Potsdam". Charivari.de. 2016-01-01. Retrieved 2017-12-15. ^ "BUNTE.de verrät: So heißt ihr Baby-Prinz!". ^ "Official guidebook of the Federal Ministry of the Interior, chapter 3" (PDF). Retrieved 2017-12-15. ^ Sonderausgabe zur Königlichen Hochzeit In Potsdam am 27. August 2011 (PDF) (in German) (20 ed.). Berlin, Germany: Weißes Blatt, Magazin für Tradition und Geschichte. 2011. Retrieved 18 November 2012. ^ a b "Georg Fredric wearing the two orders". Retrieved 2017-12-15. ^ a b "Georg Fredric wearing the two other orders". Retrieved 2017-12-15. This page was last edited on 24 March 2019, at 00:12 (UTC).